From Caribbean themed tables right by the dance floor to our secret rum bar with your own personal bartender. Rum tasting experiences, tropical food & drinks and private event packages make Laki Kane the perfect venue for birthdays, corporate events and work parties. 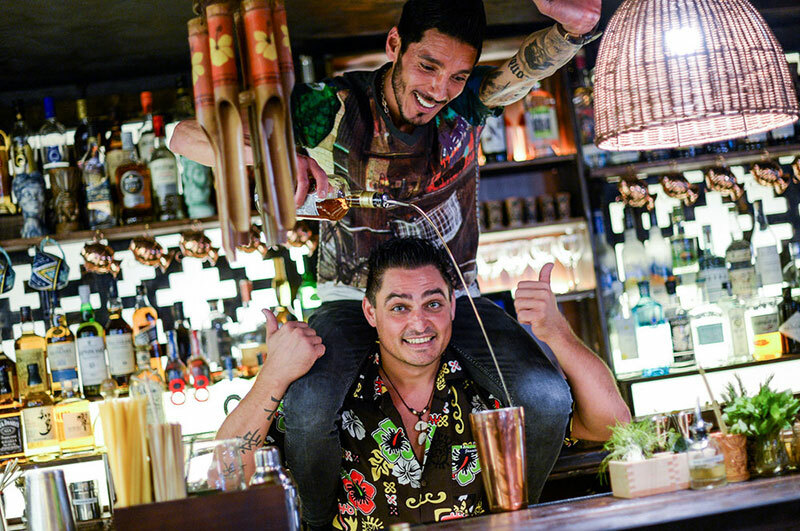 Spiced Dry Rum Club, complete with your own bartender, for one of North London’s most unusual venues. With its hanging rope lanterns, comfortable banquette seating and private standing space, Polynesia is the perfect place to dance the night away and look out onto Upper Street. Be part of the party and near the action of the bar. Hit the dance floor and put your hula skills to the test in Indonesia or cuddle up on our love-seat in Thailand. Private venue hire with your own bartender. Equipped with AV equipment and the ability to play your own tunes all night, it’s perfect for an intimate and sophisticated party. tasting and making experience, we’re here to help you throw an event they’ll never forget. For a memorable party and something a bit more unusual, book our Rum Making Experience package for a truly unique party. Add a touch of tropical flair to your event or party with our show-stopping cocktail packages for 6, 8 and 10 people. What ever the occasion, add that extra bit of style with our brilliant food and drink packages. Perfect for work dos and corporate events. Step inside our amazing London cocktail bar and discover the perfect place for your big party or event.